The 2013 awards for the best books, videos, and audiobooks for children and young adults were announced on January 28th at the American Library Association’s midwinter meeting. The announcement included the winners of the Caldecott, Coretta Scott King, Newbery, and Printz awards as well as many others. 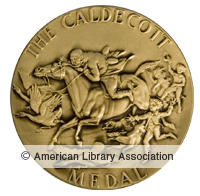 This year marks the 75th anniversary of the Caldecott Medal, which is given out for the most distinguished American picture book for children. The complete list of winners and honorees is available here.